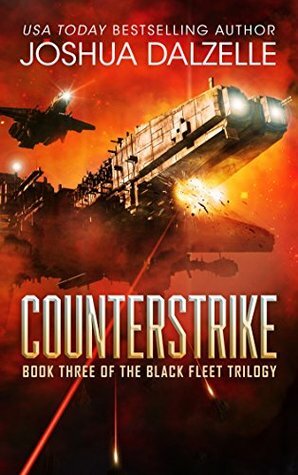 Counterstrike by Joshua Dalzelle is the final book in the Black Fleet Trilogy series of novels. With the Confederate leadership in disarray after the last engagement with the Phage, and Haven destroyed, we find what remains of Black Fleet licking their wounds in the Solar System, and Captain Wolfe has the TCS Ares in orbit around the relative safety of Earth. Many within the Terran government are concerned that the very presence of the fleet will alert the Phage, and likely bring them straight to their doorstep, and most can't wait to see the back of them. With the fortuitous arrival of Colonel Blake, there are rumours that Terran officials are keen to commandeer his Vruahn supplied spacecraft, and put its advanced technology to good use destroying the Phage. Unfortunately, due to the pacifist nature of the Vruahn, they are unlikely to simply let them do as they please. However, Colonel Blake claims to have information that could lead to the end of the war, and agrees to take Captain Wolfe to see his Vruahn handlers, and hopefully secure their help. After a successful meeting, a plan is devised, and Wolfe can finally see an end to the war, although he knows that it will come at great cost, and suspects that most of them will not survive. Like in the previous two books in the series, a lot of this book is spent aboard various starships as the protagonists hunt down the Phage. This could become boring and repetitive but the author does a good job of keeping the story moving and the journey interesting. There are a number of locations visited within the story, and I found each of them well described and integral to the plot. As has been the case throughout the series, the interaction between the bridge crew is particularly well described, especially during the tactical analysis and battle scenes. The relationship between Wolfe, Blake and the Vruahn is kept deliberately mysterious, and although frustrating at times, turned out to be a good plot device to keep the story interesting. I was concerned at one point that the relationship between Wolfe and Davies, his XO, was going to veer off into some sort of love story, but thankfully, the author kept the subplot tight, and the main story on point. I enjoyed this final instalment of the Black Fleet Trilogy, which had lots of twists and turns and shocking revelations about the origin of the Phage. It was a fitting end to a series that I thoroughly recommend reading. The author also hinted that there may be spin-off books to come, set in the same world, but concentrating on some of the other main characters like Captain Wright and Agent Pike. This is something I'd definitely welcome!